A.M. 1 with Julia in 10:49. 8 mostly alone in 59:31. Shortly before the turnaround saw Luz, then decided to run a bit faster to catch up after the turnaround, and then a little bit with her whatever pace she was going. Ran the fast portion (1.25) in 7:06. Felt good. P.M. 2 with Benjamin in 17:01. Jenny ran 1.5 with us in 12:42. 0.34 with Joseph in 3:58 pushing Jacob in a stroller. He ran the whole way without stopping. This is his first official record for a distance longer than 100 meters. Then Jacob wanted to run to. He did a "speed workout" - 2x100 first in 1:10, second in 1:04. First time I was able to get a 2 year old to run without stopping for that long. I think running is going to be more natural for the younger children as they watch the older ones. A.M. Easy 8 in 1:03:31, first 4 with Derek. Felt good. P.M. 2 with Benjamin in 17:21. Jenny ran 1.5 with us in 13:05. Benjamin decided he wanted to play the last soccer game of the season after all. So we went. 1 mile with Julia there in 10:58. Benjamin's team won 2-1. The players were smaller, and Benjamin was also more careful. No injuries this time. 0.34 with Joseph in 4:12. Jacob did 2x100 - 1:06 and 1:07. A.M. Relaxing 6 with Jeff early in the morning in 53:59. We beat the 9:00 girl by 1 second! I think if you go slower than 8:30 your virtual competitor is not a guy anymore. We were not trying to go slow, it just happened - it was dark, early, and we were deeply engaged in a conversation about Jeff's Spanish test at BYU to get credit for some classes. My three most recent training partners (Jeff, Tyler, and Derek) are fluent in Spanish, and are also young enough to where I can say : "I ran a 10 K at 6:00 pace before you learned to walk". Anybody who learned to walk after the end of September of 1985 fits into the category. But at the same time today somebody called me an Elder at the temple again, which would imply he thought I looked like a 19-year-old missionary. P.M. 0.34 with Joseph, Jenny, and Julia running, and Jacob in the stroller in 3:57. 1 mile with Jenny and Julia in 10:56 pushing Jacob. Jenny got hurt on the playground, so she ran less and slower today. Jacob then did 2x100 - 1:02, and 1:06. He is the best focused 2 year old we've ever had. He just runs - does not get distracted at all. He put a pair of running shoes on Sleeping Beauty this morning and said something to the effect that she should go for a run. 2 with Benjamin in 15:56. He did a fast 0.5 in the middle in 2:57, splits of 90 and 87. That is his new record for 0.5,and a PR for 0.25 as well. A.M. Ran 3.1 with Kory in Provo in 22:29. Did a mile pickup in 5:25. 1 with Julia in 10:56, 2 with Benjamin in 17:35, Jenny did 1.5 in 13:07. 0.34 with Joseph in 3:46. Jacob did 2x100. P.M. Drive to St. George. Quick report. 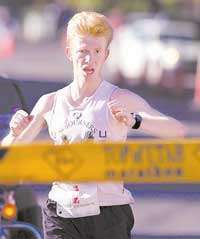 St. George Marathon, 2:34:43, 10th place. Bad weather. Rain all the way, headwind. The times were probably around 6 minutes slower for the same effort. Feet got soaked, misjudged my fuel levels, and did skipped too many aid stations. Ran out of fuel, hit the wall, increased the fuel intake, was able to recover some, but still the last 10 K in 39:48. Live and learn. Interesting that many others were having similar problems. Blog did well - we captured 5 out of the top 10 spots. $100 cash for being first from Utah County + $150 for winning the age division last year and finishing this year + $100 travel certificate. Not bad for a mediocre performance, makes up for getting nothing (except the come-back travel stipend) last year for a 2:23. Sometimes you have to come back next year to collect for the unfairness of the prior year. The start was wet, but it did not look too bad at first. However, after the first mile in 5:56 I knew that something serious was up. Even though I hid myself in the pack the best I could it felt hard. I would have normally blamed this on my fitness, but the pack with the exception of a couple of rabbits was in no hurry to speed up. Even after that mile when Nick and Clyde tried to pick up the pace, the next mile was 5:49, and it did not feel like a jog at all. On the third mile Dave Holt tried to pick up the pace. Knowing Dave I knew what he was thinking. "I do not care about the rain and the headwind, if I just believe in myself I can get my goal time!" But the laws of nature cannot be ignored.This would have been bad for him and every blogger in the pack. I warned him to not even think of racing for time and not to break the pack that early. Ideally I wanted to see everybody together at 20 even if that meant that some would have to run a bit faster, and others would have to hold back. My feet were wet from the start, and I was running very tense. We made it to 5 miles in around 28:15. I started to feel a bit better. The pack was composed mostly of bloggers, but there were some dark horses in it. Too many dark horses for my taste - I wanted to see 1-10 blogger sweep with no gaps. One of them looked particularly troublesome. He had a perfect collegiate runner form. This could be both good and bad. If he is a typical collegiate runner, no worries, he'll blow up after 20. But if he's done his homework, he could be full of trouble. I learned his first name at the bottom of Veyo from the cheering. It was Mark. I wondered about his last name for the rest of the race, but he had taken off, so I could not ask. I learned his last name at the finish. It was Currell. Indeed he was a recent college grad. He ran for SUU. His collegiate times were good enough to run for college but nothing exceptional. 4:25 mile, 3:59 1500, 14:31 5000, and 30:51 10000. However, he had run a remarkable race after college winning Seafair 8 K in 24:30, ahead of Mike Sayenko (24:39), and our Sean Sundwall (25:03). Seafair is not a fast course. Mike ran 2:18 at the 2008 Trials, and was fifth at TCM with 2:19 in tough conditions this year. Sean around that time ran 2:22 alone on an honest course. Anybody who can beat Mike and put a 30+ second gap on Sean over an 8 K can rock in the marathon when properly trained. And Mark sure did. Once Veyo started he literally disappeared into horizon. Jeff commented - "If he is going to come back, he would have to crash pretty hard. Otherwise, he is not coming back." I did better than I expected going up Veyo. First Dave Danley and Nick got an little antsy and tried to go after Mark. I got concerned, and tried to go with them in fear of losing contact. But then I realized I needed to ease off. Jeff McClellan and Dave Holt passed me and gapped me, but then I worked my way back to them. Soon we had a pack again - Nick, Dave Holt, Jeff, and myself. Dave Danley was about 20 seconds ahead, and we maintained the distance. We lost Clyde and the rest of the dark horses. We plodded along at around 6:00 pace up the Dameron Valley. Got to the half in 1:15:22. Reeled in Dave Danley, and he joined us briefly. At around 14 Dave Holt's horses started to neigh, he pushed and broke the pack. Jeff went after him, Nick stayed with me, and Dave Danley fell back. The cold weather messed with my senses. I felt I had plenty of fuel, and being as wet as I was I did not feel like either drinking or (side effect) spilling Gatorade on myself. So I was missing a lot of aid stations, and not getting very much in me when I actually bothered to grab a cup. As it turned out I would pay for it later. Had it been dry and warmer the chills would not have obscured the readings of the fuel gauge. But I was clearly unprepared for the conditions. I had not factored in the altered perception effect. I had also underestimated that my body would be heating up the air for 26 miles, and had not dressed properly, nor was I taking in the extra fuel for warming up the environment. You would think that in over 45 marathons I would have learned better. Some people are just slow learners. Nick made a move, and dropped me as if I were standing still. It was almost like he was a lead vehicle cop that accidentally hit the accelerator. I was running alone, but feeling fairly strong as we went up a small hill. But then there was Winchester. Based on how I felt at Veyo and on that small hill maybe half a mile before Winchester I thought I'd scale it no problem. But once we got there the head wind picked up and I started to lose steam. I never regained for the rest of the race. Nick stopped to tie his shoe, and I passed him. Clyde, Nick, and Pepi Petersen went by me as if I was standing still. I then caught up to Jeff, and he told me he was not feeling good. I told him to tough it out. I began to realize that I was running out of fuel. Unfortunately my hands were shaking and I was spilling half of the Gatorade into my eyes. The eye contact with lemon acid (I think) in combination with the already low blood sugar was causing a fuzzy vision. This was annoying, but provided food for thought. Lemon acid drop in the eye could possibly act as a blood sugar test on the run. 20 miles in 1:54:55, but who cares about the time. Running just to finish and hopefully stay in the top 10. Josh Steffen went by me as if I were standing still around mile 21. Jon Allen would be next, I thought, of the people I knew. Fortunately I understood the nature of the problem, and started slowing down at the aid stations, taking double dozes of Gatorade, and making sure all of it went in. But it would take another couple of miles for it to start working, and during that time I would have to jog. Got passed by Chan Yee Woo from Iowa as if I were standing still. Hit the Diagonal. Barely passed some girls that were out for a jog. Saw Lybi with a huge banner cheering for the bloggers. Around mile 25 heard another runner approaching. Thought for sure it would be Jon and got ready to congratulate him on a great race. But it was not Jon, it was Motoharu Fukunaga from Japan. Negative advertisement for the blog, but it worked. He asked for an FRB card afterwards. He quickly put 20 seconds on me. With about 0.8 to go the Gatorade kicked in, and a portion of my strength returned. I picked up the pace, started to feel some power in my legs, and my racing mindset returned. Motoharu started coming back, but the gap was already too big. I did not know what place I was in, and was relieved to find out that I finished 10th. Had an interesting fuel economy learning and faith building experience on the way back. The pressure at the CNG station in St. George was low, so we were able to fill up the Fast Running Van only half way. Cedar City was even worse. So we left Cedar City, and as far as I knew we were going to run out of gas 30 miles or so away from Fillmore, and then have to call for a tow truck. That did not sound exciting. I said a silent prayer. At first I asked the Lord to help the van make it. Then I thought I needed to be more specific and pro-active. I asked the Lord to show me what I needed to do so the van would make it. I was already driving 55 mph and getting passed by trucks. I had considered drafting, but the trucks seemed to me to have been going too fast to make it worth it. The moment I finished the prayer another truck passed us, but not as fast as the other trucks. I thought, try drafting. The truck was going 62 mph. I asked Kory and Jeff what they thought about that. They both agreed that drafting at 62 mph will give you better fuel economy than 55 mph alone. So I drafted behind the truck the whole way, and we made it with 1/8 of a tank left. The pressure in Fillmore was low again, and again I was able to fill up only half way. But this time I knew what to do, and we made it to Provo with a little bit less than 1/4 of a tank left.